Chris Soules is forcing Whitney Bischoff to hang out with Witney Carson! The Bachelor Chris Soules has no shame in his game – and on March 29 he stepped out with his Dancing With The Stars partner and rumored girlfriend Witney Carson and his fiancée Whitney Bischoff. The Internet has been buzzing about Chris Soules cheating on Whitney Bischoff with Witney Carson, but Chris could care less. Chris has two things on his mind, fame and money, and he isn’t going to let his fiancee’s feelings get in the way of that. After their March 29th Dancing With The Stars performance, Chris Soules took the two women in his life, Whitney Bischoff and Witney Carson, out to celebrate – talk about awkward! Can you imagine having to smile in the girl’s face that your fiancé is cheating on you with? Whitney Bischoff has gotten herself in to a little pickle: she doesn’t want to go home to Chicago and break up with her cheating fiancé and kiss her new life of red carpets and star-studded dinners goodbye, and fade into Bachelor obscurity. But, in order to stay in the spotlight, she has to swallow her pride and pretend that she doesn’t know that Chris Soules is cheating on her with his dancing partner, and keep up their sham of a romance. At this point, we don’t even feel sorry for Whitney Bischoff anymore. There is a high-price to pay for fame, and Whitney is paying by staying in a fake engagement and letting her fake fiancé make her look foolish. The real question is, how many more dinners with Chris’s mistress can Whitney Bischoff sit through before her pride gets the best of her and she finally snaps? 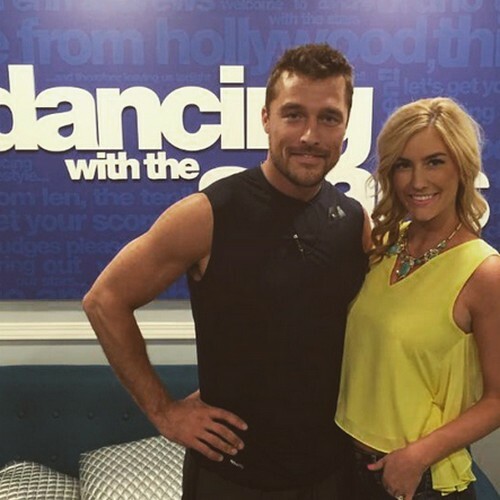 What do you think of Chris Soules cheating on Whitney with Witney? Do you think you would be able to turn the other cheek? Let us know what you think in the comments below and don’t forget to check CDL tomorrow for more Bachelor and Bachelorette spoilers and news! Whitney Bischoff NOT Planning Chris Soules Farm Wedding – Bachelor Couple Getting Married?